Relax, unwind and restore or simply feel beautiful. Book a treatment with one of our highly skilled therapists, who will design each session to your specific needs. We have a wide range of treatments working on different levels, such as “relaxing”, “therapeutic & healing”, “energetic & spiritual”, as well as “beauty” sessions available. Our two beautiful treatment rooms and open air space, invite you to let go and deeply relax. Don’t know what to choose? Take advantage of the free informative talk with one of our Well-Being Coaches, who can give you a general overview and a better understanding about our unique holistic treatments. If you have specific needs, you can book also a private consultation with one of our specialists. We will personalize this massage according to your needs combining the depth of deep tissue with the restorative effect of relaxation massage techniques. As a part of the holistic experience, a unique aroma with high quality essential oils between Rose, Lavender, Rosemary and Clementine will be created for your treatment. Aromatherapy Massage is ideal to relieve physical nuisances, emotional stress and helps to find inner balance. The Balinese is an intense tissue massage, using medium to high pressure in order to reach and work even deeper muscle layers. This massage relieves muscle tension, harmonizes and improves the integration of internal systems. Not sure yet which treatment is the most suitable for your needs? In this case we recommenend to book our following treatment at first. Our therapists will see together with you what your special needs in this moment are and will tailer-cut the treatment according to that. They will also be happy to give you recommendations for further treatments, if needed. The primary goal of Deep Tissue Massage is to reduce pain and discomfort, while improving blood & energy flow and the body’s ability to heal itself. Deep Tissue Massage is not only relaxing, it also helps to “lengthen and release chronic muscle pain” that frequently feels tense and gets stuck in uncomfortable holding patterns. Working on the deep layers of muscle tissue and fascia, we support to release any “knots” throughout the entire body. By moving slowly but deeply, we set the pace not just for the physical body but also for the mind to slow down and deeply relax and let go, so that healing can take place. The treatment is very beneficial in cases of lower back pain/sciatica, chronic shoulder & neck pain, high blood pressure and arthritis. It also reduces anxiety and stress in your entire being. Reflexology is a regulating, preventive technique that promotes deep relaxation and activates the body’s self-healing mechanisms. The technique includes manual pressure onto precise points or areas of the feet, the reflex points, which correspond to specific areas of the body. By stimulating the reflex points, health is promoted through the body’s energetic pathways. The benefits are particularly in reducing pain, enhancing relaxation, preventing certain symptoms and pains as well as gaining mental and physical balance. The Thai massage is a unique body therapy, based on the ancient Indian Ayurvedic and yoga teachings with influences from the old Chinese meridian system. In Thailand, nowadays it is an integral part of the culture and traditional medicine, successfully applied to people of all ages. In contrast to other massage techniques it is made on the ground, without using oil, with comfortable, lightweight clothing. The effect of one-hour massage is most likely to the pleasant and liberating body feeling after an intense hour of Yoga with subsequent (soul) massage. 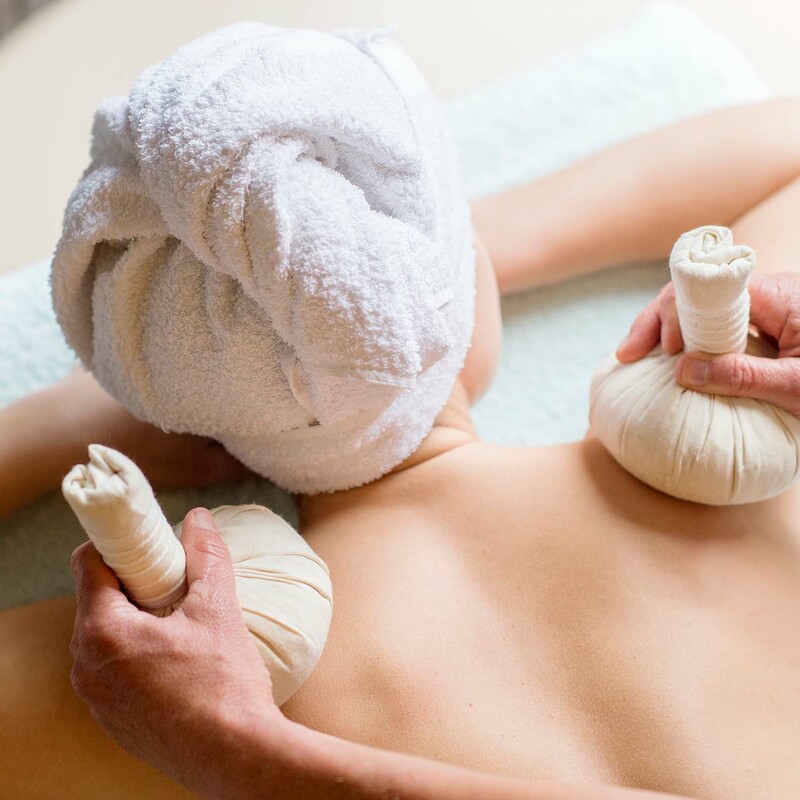 In this session you’ll enjoy a relaxing Ayurvedic massage in the head, neck and shoulders. Consist in soft and stimulating frictions and pressures in vital energy points with oils and natural essences, followed by a vibrational massage with Tibetan Bowls to balance chakras, energize and harmonise. The Myoreflex Therapy is a manual regulation therapy. The treatment takes place on the muscular (myos) system of the musculoskeletal system. At the same time, it accesses and aids all bodily functions and organs. Myoreflex Therapy primarily deals with the muscle insertions. After functional and palpation discovery, pressure is applied to specific reflex points of the musculature system to stimulate change. This is forwarded to the brain and from there, the voltage pattern of the respective musculature is regulated. When the muscular and movement patterns change and regulate, symptoms can disappear. When joints and soft tissue structures are relieved, chronic, degenerative issues can be stopped and healthfully regenerate. This therapy is based on Dr. med. Kurt Mosetter’s work from various modalities: anatomy, orthopedics, individual pain biography, biochemistry, neurobiochemistry, physics, biokinematics, psychological medicine, psychotraumatology, TCM, acupuncture systems & brain research. The myoreflex therapy is particularly suitable for a variety of diseases, including, but not limited to herniated discs, chronic pain, scoliosis, functional hypertension, functional respiratory problems (asthma), migraines, dizziness, tinnitus, panic attacks, burnout, ADD/ADHD and more. Massage and bodywork is an ancient healing art. Shamanic bodywork techniques work on the physical and luminous energy body. They help to clear and restore harmony and to balance the system by reconnecting the individual to their optimum vibrational resonance and alignment with the soul's Divine purpose. Combining long, flowing, nurturing strokes, deep tissue and acupressure with shamanic healing practices. This work helps to release tension, pain, stress, toxicity, trauma and wounds. It reprograms your system by organizing old contracts, programs and family constelations. The massage supports the body's natural ability to heal itself. In all treatments we are using products from Ecologics Cosmetics. Ecologic Cosmetics is an exciting family project born in the Mediterranean island of Mallorca in 1993. They have always understood the importance of using environmentally conscious products, and firmly believe in the positive effects of efficient, natural cosmetics and organic skincare. Ecological cosmetics care & help improve your skin with natural, respectful and organic ingredients, whilst protecting the environment. In all treatments marked with our therapists are using products from Gaia Natural Cosmetics- inspired by Nature and born from the union of the sea and earth. All Gaia cosmetic products are hand-made from the purest plants and herbs organically grown at their finca in the heart of the Tramuntana mountain range, situated in the west coast of Mallorca. Make a dream come true and be delighted by this marvellous combination of treatments! You will enjoy a mini facial (cleansing, soft exfoliation, face massage) with natural products and antioxidants, a nourishing scrub and a full body hydrating massage. Enjoy a full body treatment designed to nourish and rehydrate your skin. The purest cocoa body butter will be used to infuse your skin with softness, while the orange peel, Rosemary and Flor de Sal salt act as gentle and healing exfoliating agents. After the application of our Aloe Vera Cooling Body Lotion you will leave this session renewed and with glow. Immerse yourself into an amazing and more profound facial treatment, rejuvenating your skin with the natural antioxidants from the sea. This experience starts with a gentle facial cleansing and scrub, with rose petal powder and cocoa butter, followed by an application of a revitalizing seaweed clay facial mask. While the potent antioxidants work on your face, you will enjoy a refreshing massage of shoulders, arms and décolleté with GAIA Aloe Vera cooling lotion. The ultra-rich Rose Cream will provide your skin intensively with moisture to be strengthened from the inside. The result is a silky smoothness and healthy radiation. Immerse yourself in the female passive form of Yoga. Let the body come into silence. In Yin Yoga, Asanas (physical exercises) are performed while sitting or lying down and kept longer supported by different probs. Therefore, these affect the deeper layers in us. Yin brings peace and new energy and has a profound healing quality in combination with Cranio Sacral Therapy. Consists of a very subtle touch around skull, spine, sacrum, hands & feet. The session combines support for body and soul in their inherent healing process. Our therapist will be thrilled to meet you for a private consultation over a cup of tea and chat, a valuable time to discuss anything you will like to improve or change within your general mental wellbeing. This session will be specially tailored to your needs and with the intention to help you. We will guide you through yogic and mindfulness techniques to control your emotions, stress and anxiety management and/or structure of negative patterns of thought and behaviour. This is a 1 to 1 session with the intention to develop onternal awareness and identify any postural imbalances, muscle length, joint mobility and functional movement will be tested on a static and dynamic movement. This will benefit anyone with rounded shoulders, hunched chest, hyperlordosis and other imbalances. The session will focus on building up a series of Yoga Therapy strong alignment, strength and mobility based exercises, along with health lifestyle habits to correct any imbalances. Ignite your spark! Do you want to increase your overall sense of well being with a delicious private Yoga class in the comfort of your own unique needs? Our Yoga teachers are happy to lead you deeper into the practice. Please talk to us and we will be more than happy to inspire you! All treatments marked with are made using products from Gaia Natural Cosmetics- inspired by Nature and born from the union of the sea and earth – the GAIA Natural beauty line offers a unique SPA experience. All their cosmetic products are hand-made from the purest plants and herbs organically grown at the GAIA Finca in the heart of the Tramuntana mountain range, situated in the west coast of Mallorca. The very best of GAIA Natural range is at your disposal.